Kids taking care of littler kids. It happens in families all the time. Schools are making it a mission. Bullen Middle School in Kenosha, Wisconsin, has made it an occupation. Shout Out to my Youngest Blessing for being accepted as an 8th Grade Transition Coach at Bullen Middle School! My pride for this Kid grows every single day❤️❤️❤️CONGRATS CHRIS!!! They’re called transition coaches, and eighth-graders sign up for many reasons, but mostly because it’s the right thing to do. “It’s an opportunity at a leadership role and to help the sixth-graders. Because, you know, you’re nervous when you first get here,” Mylee Spruillee told the Kenosha News website on the first day of school last week when she and her fellow coaches lined the halls, raucously greeting the sixth-graders with cheers and high fives. This is the welcome tunnel as students join the Bobcats for the first time! Thanks for the cheers of welcome Transition Coaches!!! The eighth-grade ambassadors, who welcomed their former elementary school peers to the Kenosha middle school campus, helped make that philosophy a reality — and they’re paying it forward, or backward, as the case may be. Transition coach Diego Hernandez told Kenosha News how jittery he was during his first week of school, until the eighth-graders charged with the duty he has now showed up. Physical education teacher Jackie Meteyard came up with the idea of eighth-grade coaches, and she, along with eighth-grade science teacher Chris Strangberg and eighth-grade special education teacher Brian Schulz, coordinate the training. These kids take their jobs seriously. Their summer training includes a ropes course. Day one saw the coaches taking sixth-graders on a 90-minute tour of the school and showing them the ins and outs of their new environment. This included practicing opening their lockers. The No. 1 cause of anxiety in incoming sixth-graders, Jankiewicz said, is remembering their locker numbers. Jasmine Kray-Weatherford, 11, found transition coaches helpful with that. She had three locker combinations to remember last year, including ones she’d used for gym and music. 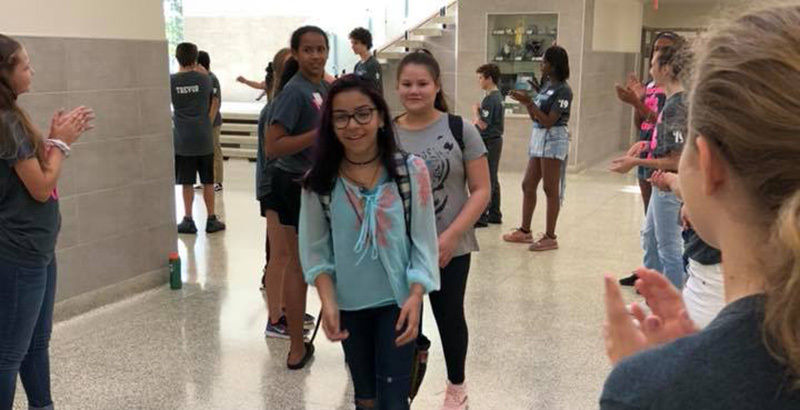 FIRST DAY OF SCHOOL: For more than 200 Bullen Middle School sixth-graders, Tuesday was a mix of butterflies, excitement and a look forward to the promise of a fresh start. “My goal at the end of the day is that they can go home to their loved ones and say, ‘You know what? Today was a good day and I felt comfortable and I was nurtured,’” Jankiewicz said. These eighth-graders work hard, answering questions, being an older, mentoring shoulder for the newbies to lean on. But in the end, the high fives are for themselves. There’s a sense of camaraderie you can’t put a price on. “We’re always doing fun things … to help them just know how to operate,” Mylee said. And such kids deserve some fun of their own. Which always includes ice cream. The transition coaches gathered for Culver’s Night at a popular ice cream parlor and restaurant to celebrate their good work this week, and no doubt continue to brainstorm. The coaches will mentor the sixth-graders throughout the year, but the relationship is already off to a strong start.